The magnificent Conisbrough viaduct is impossible to overlook with its 21 arches, 150 foot lattice iron girder span over the river, and 1,527 feet in length. Opened in 1909, it was part of a connection between the Hull & Barnsley Railway and those of the Great Northern and Great Eastern. It consists of more than 15 million bricks, and features some beautiful decorative brickwork. It is so vast that an aerial ropeway was built to carry men and materials across the valley during its construction (see picture on the right). 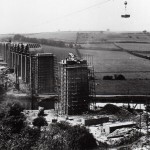 The railway closed in 1965, and the viaduct was transferred to Railway Paths in 2001. Sustrans and Railway Paths converted the unofficial path over the viaduct into a cycleway in 2010, after adding panels to the viaduct’s parapets in 2008. These works were funded by the Railway Heritage Trust and Doncaster Council. For a detailed description of the works, please visit Forgotten Relics. The viaduct is now on NCN route 62, and part of the Trans Pennine Trail – a multi-user route across the North of England from Southport to Hornsea. 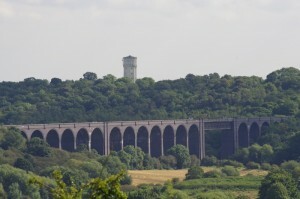 You can catch a glimpse of this viaduct from the train when travelling between Doncaster and Rotherham.